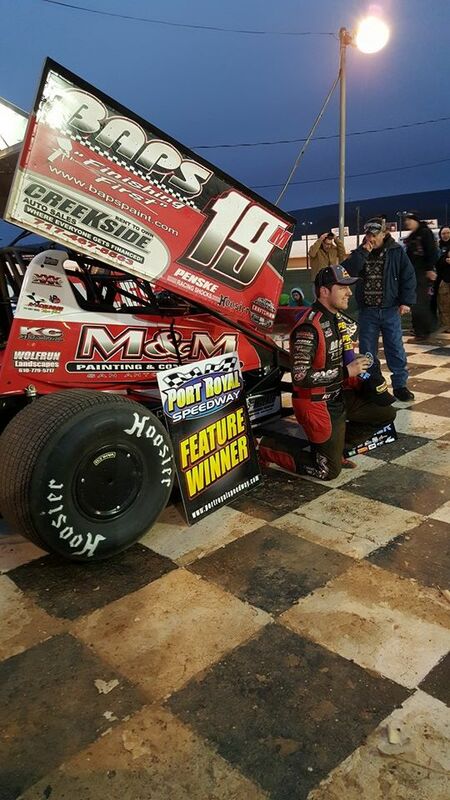 PORT ROYAL, Pa. – Brent Marks of Myerstown took the lead from Dylan Cisney late in the event to pick up the 410 sprint car feature Saturday night at Port Royal Speedway. Elsewhere, in the 22-lap super late model main, Hamburg’s Andy Haus made it two in a row in the division to put his mark on the early season. Cisney and Doug Esh started on the front row of the 25-lap sprint car main and Cisney jumped into the lead at the start. The first 10 laps of the race went non-stop with Marks muscling by Esh for second on the sixth tour. Just prior to that, Danny Dietrich pulled into the pit area under his own power and then just a lap before the lap 10 yellow, Aaron Ott also dropped out of the race. Marks took a shot at Cisney on the restart while opening day winner Greg Hodnett tried to get under Esh for third but the running order was still the same with 12 down when a final caution regrouped the field for a stopped Ryan Taylor. Marks again took a stab for the lead at the new green as did Hodnett for third and this time Hodnett came up with a run that would net him third spot with 10 laps to go. As the race got to lapped traffic with five to go, Cisney found Marks close enough to make a bid and as the leader negotiated the backmarkers, Marks used a low move in the first corner to take control with three laps to go. Cisney made a valiant effort to go back out in front by pulling alongside Marks as the pair shot onto the backchute but Marks was stronger, surging into firm command as the pair hit the third corner. And from there, Marks took the win, the sixth of his career at the track by 1.507 seconds. Hodnett was third followed by Esh and TJ Stutts. Sixth through 10th went to Brock Zearfoss, Mike Wagner, Steve Buckwalter, Mark Smith and Logan Wagner. Heats went to Cisney, Esh and Marks. Haus started on the pole of the super late model main and wiped up the field for the victory worth $1,500. Last week, Haus took the checkers in the season opener whiel racing to hold off a closing Gregg Satterlee but this week his win would come uncontested. His pace was only slowed on the seventh tour and at that time he had built up a 3.6 second lead over Mike Altobelli. Fifth starter Kyle Hardy took third from Tim Smith Jr. with a lap to go, forcing Smith to cross in fourth with Rick Singleton finishing fifth. The victory was Haus’ sixth at the historic oval, coming by a margin of 7.782 seconds. Sixth through 10th went to Tim Wilson, Jason Covert, Mike Lupfer, Dylan Yoder and Nick Dickson. Heats went to Andrew Yoder, Hardy and Singleton.